Artist highly rated and sought after (artprice, Akoun, artnet, Bénézit). 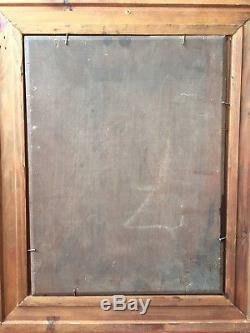 This painting is framed with a gold leaf molding, good condition, some very small gaps, 60cm x 42cm of total size. Similar paintings can be found in the douai (chartreuse) and touquet - paris - plage museums. Hand delivery to Lille by appointment. Certificate of authenticity provided (expertise auctioneer). I am an art historian and collector of artists from the north of France. 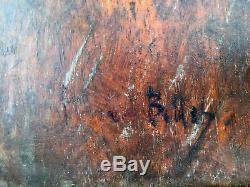 A really beautiful signed, inscribed oil by stone depicting ticket. 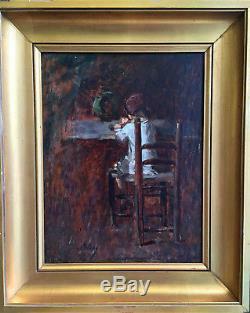 A young girl drinking his soup. The work is in beautiful unrestored condition. The artist is trained under the name of Breton and emile breton and his work can be found in many museums. Signed lower left, arround 1900. 13.8 x 10.6 inches (23.6 x 16.53 inches, with frame) / condition. Studied under jules and emile breton and made his debut as an artist at the 1867 salon. He won a third-class medal in 1873 and a second-class medal following year. He enjoyed painting scenes of peasant life. In addition, he produced original engravings. Lille: fishermen from the outskirts of Boulogne; field of carnations. London victoria and albert mus. : washerwomen; fisherwomen by the sea; fisherwoman in granville; before the fishing trip. Paris, 1876: little cowherd girl, 2,200 francs. Paris, 1879: woman grass cutter, fr 3,150. The hague, 1889: washerwoman, frf 2,420. London, 1894: shrimp fisherman, 1,400 francs. New York, 1902: shepherdess, usd 400. Paris, 17 dec 1902: woman water-drawer, frf 260; donkey-drivers, 110. London, 18 Jan 1908: before the fishing trip, gbp 115. London, 21 march 1908: contraband tobacco in russia, gbp 16. London, 29 june 1908: woman fishmonger from eteret, gbp 42. London , Jan 30, 1909: before the fishing trip, gbp 105; english peasant woman, gbp 18. London, 30 june 1910: winter fuel, gbp 94; young girl knitting, gbp 63. Paris, 4-5 dec 1918: little fishermen, 35 francs; goats grazing in touquet forest, fr. London, April 22, 1922: peasant woman, gbp 11. London, april 6, 1923: sunset, gbp 5. London, April 8, 1927: haymaker, gbp 15. Paris, February 16, 1928: woman grass cutter, fr. New York, 30-31 Oct 1929: woodcutters, usd 75. Glasgow, Nov 2, 1933: shepherdess knitting, gbp 10. London, Nov 26, 1937: waiting for the fishermen to return, gbp 8. Paris, Jan 7, 1942: cabaret scene , 1.400 francs. 29, 1976: the wreck (oil on panel, 12¼ × 9 ins / 31 × 22 cm) 220 gbp. New York, 3 June 1981: woman harvester (1879, watercolor and gouache, 21½ × 15¾ ins / 54.6 × 40.2 cm) usd 1,000. 15, 1984: Two young women on the beach (1882, oil on canvas, 13½ × 18 ins / 34 × 46 cm) usd 2,700. New York, May 24, 1988: Women wood gatherers (1874, oil on canvas, 44½ × 58¼ ins / 113 × 148 cm) usd 38,500. New York, May 25, 1988: Women Gleaners (1881, oil on canvas, 24 × 19¾ ins / 61 × 50.2 cm) usd 9,350. London, 6 June 1990: scanning the open sea (1882, oil on canvas, 13 × 17½ ins / 33 × 44.5 cm) gbp 2,750. 1, 1993: young shepherdess (oil on canvas, 34¼ × 25½ ins / 87 × 64.5 cm) gbp 3,450. Celestial stone ticket, born in canteen. And died November 26, 1922. Pierre ticket is the son of an industrialist established canteen. He abandons this activity to become the student of painters Breton emile. He started at the company of French artists. From 1868 where he presents scenes of genre. He receives a medal of. Class in 1873 and from. He realizes naturalistic scenes, in the manner of Breton jules, country (douaisis) or maritime (Boulogne, yport). After 1900, his art became less academic and more open to post-impressionism. Pierre ticket form to the painting of the students, whose daughter aline guine-ticket. He rubs shoulders with the family of Breton jules, the demon-breton couple and some wissant painters, including the couple henri and marie duhem. Fisherman girl, oil on canvas. Young fisherman; waiting, oil on wood. Young fisherwoman, 1920, oil on canvas. The airplane, oil on canvas. Country Rest, 1915, oil on canvas. Field of illettes, oil on cardboard. 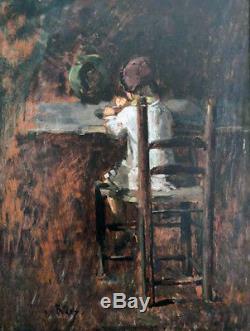 Sitting woman, oil on canvas. Books exhibited at the salons. The suites of a card party, 1868 parlor. Fisherman on the ambleteuse beach (pas-de-calais), 1869 salon. The part of the mayor, 1869 salon Fisherman from the surroundings of Boulogne, 1870. The time of the tide, Normandy coast, 1872 salon, formerly at the Luxembourg museum. Souvenir d'ambleteuse, Salon of 1875. Young vegetable garden, salon of 1876. A lumberjack, living room of 1878. Fisherwoman of equilles, living room of 1878. Before the fishing, living room of 1879. The gleaners, living room of 1881. Souvenir of the cap of alprech, fisherman of the portel, living room of 1896. Oyster gatherers (digging for oyster), 1884, Hermitage Museum, St. Bringing in the wrestling, 1885, glasgow museums resource center (gmrc). Young girl lying in the grass, 1899 "gières 7bre 99\Pine forest with touquet, 1907, touquet, musenor. Pine forest, 1907, the touquet, musenor. The cup of coffee, 1917, the touquet, musenor. Country Rest, 1915, douai, musenor. The airplane, 1920, douai, musenor. Before fishing, fine arts museums of san francisco. Fishermen on the coasts of Normandy, the new illustration by a society of painters-etchings, paris, ed. Philip Gilbert Hamerton, London, artoftheprint. The item "stone child ticket jules breton maroniez tattegrain chigot demont-breton" is on sale since Monday, July 30, 2018. It is in the category "art, antiques \ art of the nineteenth and before \ paintings, enamels". The seller is "prestigeartgallery" and is located in Lille. This item can be delivered anywhere in the world.